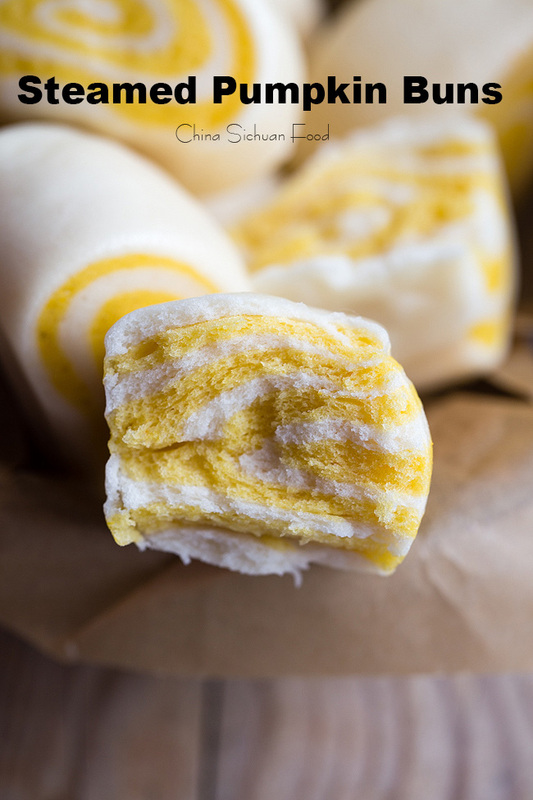 Yummy and colorful Chinese steamed pumpkin buns. 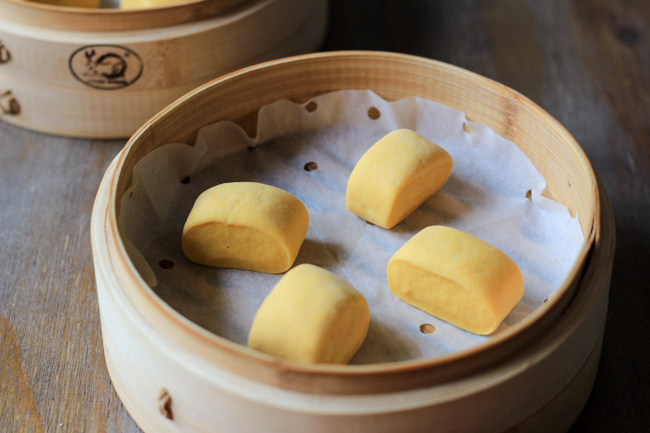 I love to play with the dough when I started making basic Chinese steamed buns (Mantou) at home. 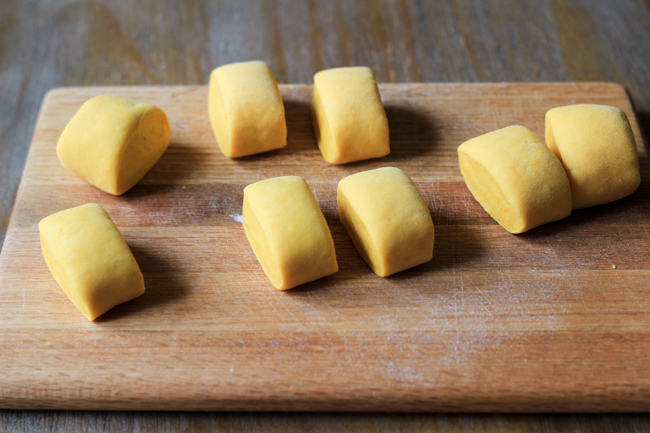 At the very beginning, I use hand kneading and spent a quite long happy kitchen life with all kinds of dough balls. Earlier this year, I got a stand mixer as a birthday gift. From that time, I started a new period in which I made steamed stuff from starch at least twice a week. 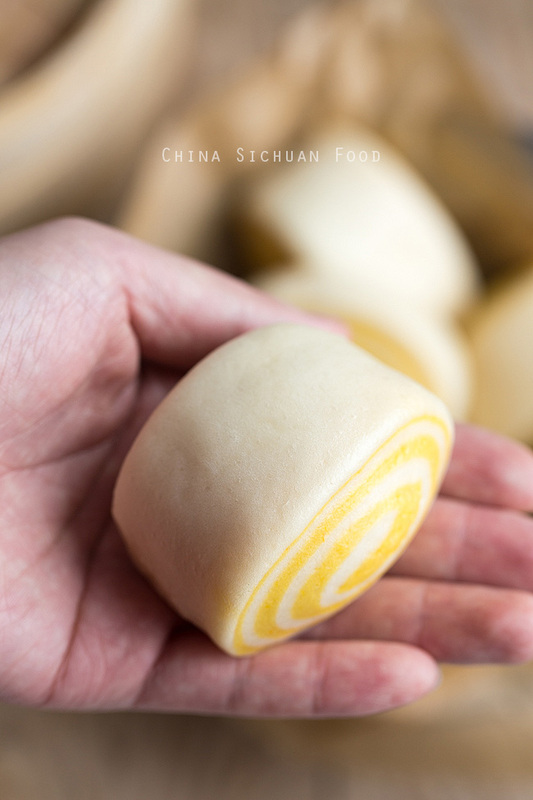 Compared with soft and milky bread (like this one), the dough of steamed buns is much easier to make. They have a denser texture and plain taste. 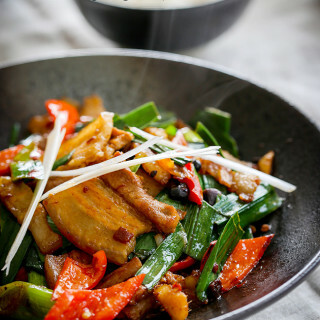 But we can always do some changes and make plain steamed buns colorful and interesting. 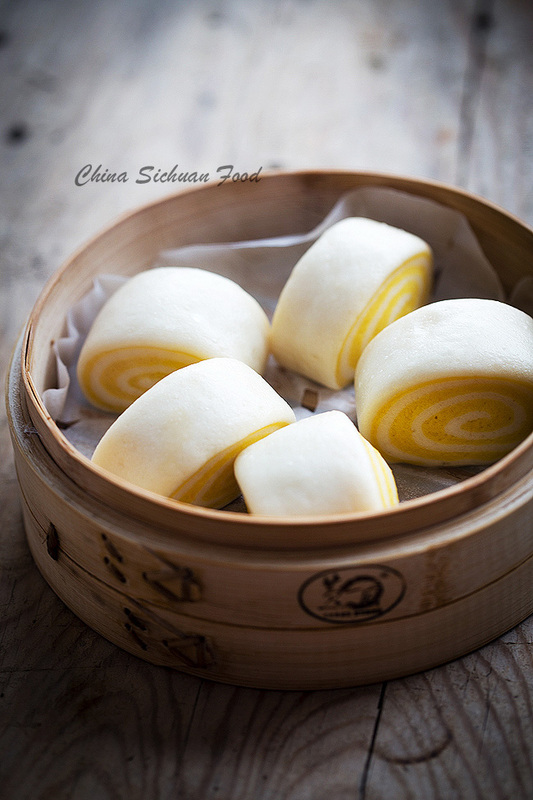 I have listed two ways of making a wonderful steamed pumpkin buns. 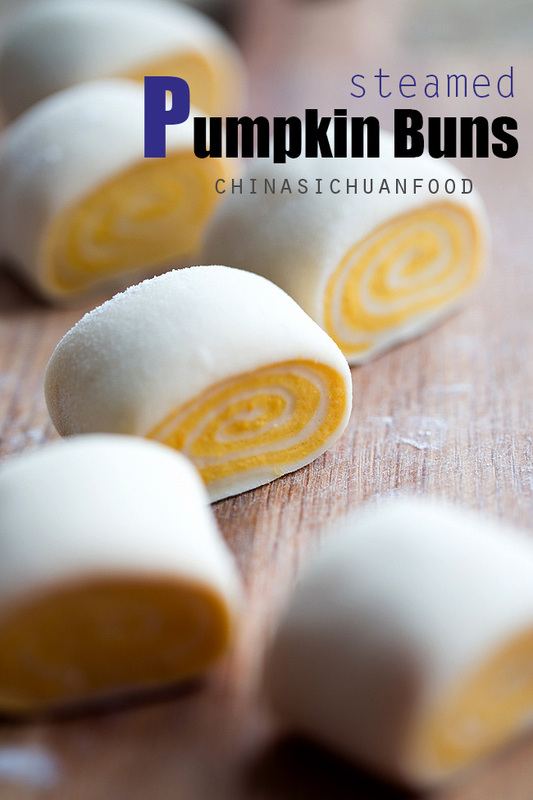 You can make pure yellow pumpkin buns or make a swirl version mixing with a white dough. Pleaser weight the pumpkin cubes after peeling. 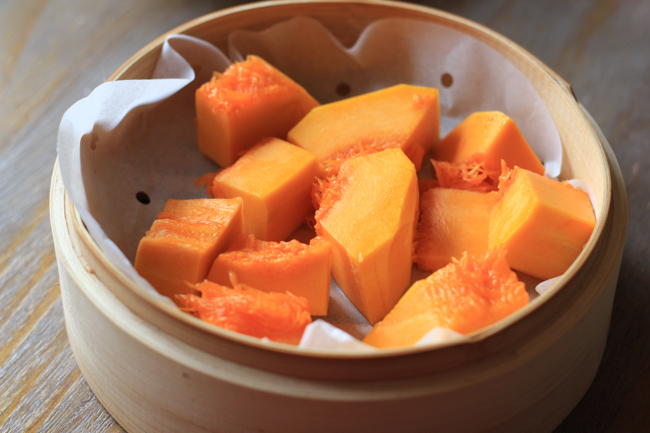 As pumpkin contains a large amount of water, there is no need to add extra water in the dough. Clean the pumpkin; remove the skin and the filling, cut into small cubes. Place all the cubes in a steamer. steam for around 20 minutes until well softened. Then blend it until really smooth. Set aside to cool down to Luke warm. 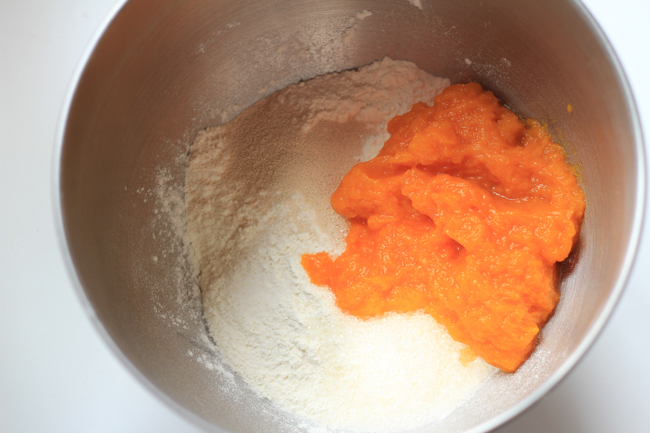 In a mixing bowl of a stand mixer, add all-purpose flour, salt, sugar and yeast then pour in pumpkin puree. Knead for 6-8 minutes until you get a smooth, elastic and soft dough. Transfer it to a bowl and cover with plastic wrapper until the dough is almost double in size. Divide the dough to two halves. Shape one of the two halves into a long log. Cut it into 8 small portions. Then repeat to finish the other half. 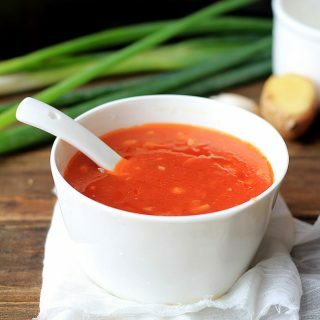 Set up the steamer by adding enough cold water to a large pot. Place the buns into a lined steamer and then count 15 minutes after the water boils. Wait for 3-5 minutes and lift the cover. Serve warm. 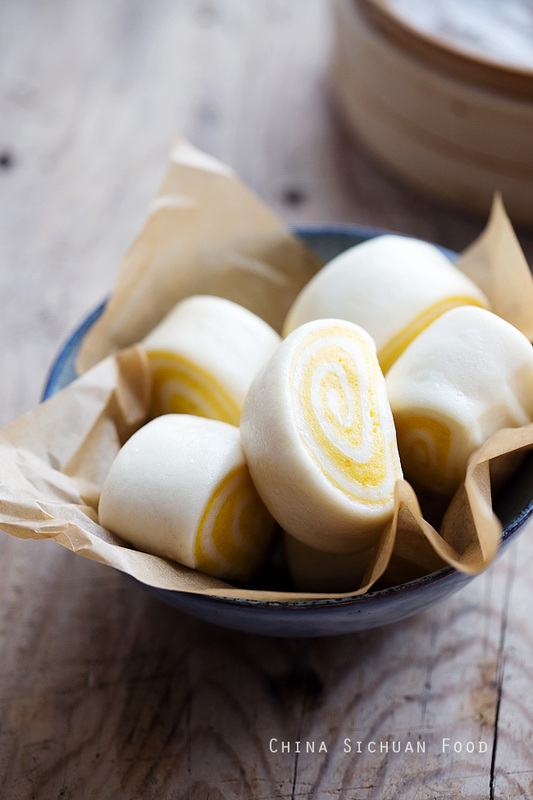 If you want to make the swirl version: make plain white dough according to Chinese steamed buns. We need half of the pumpkin dough. 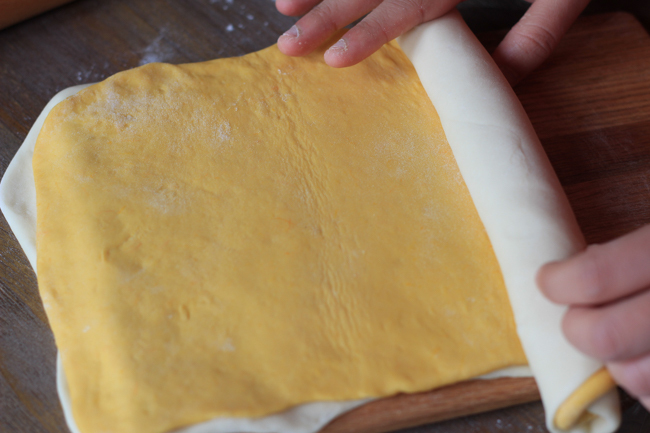 Re-knead the two dough balls until smooth again and roll each one out to a large rectangle (around 20cm long and 9cm wide). Lay the pumpkin wrapper over the white one and then roll the layered wrapper up tightly. Divide the long log into two shorter ones. 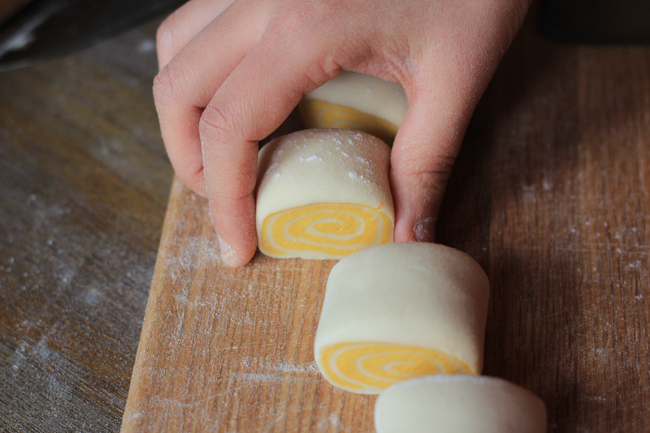 Take one out and slightly press the log to make it longer and tighter when rolling on the operating board.With a sharp knife, discard the two ends and cut the remaining part into 6 equal portions. Repeat to finish all. 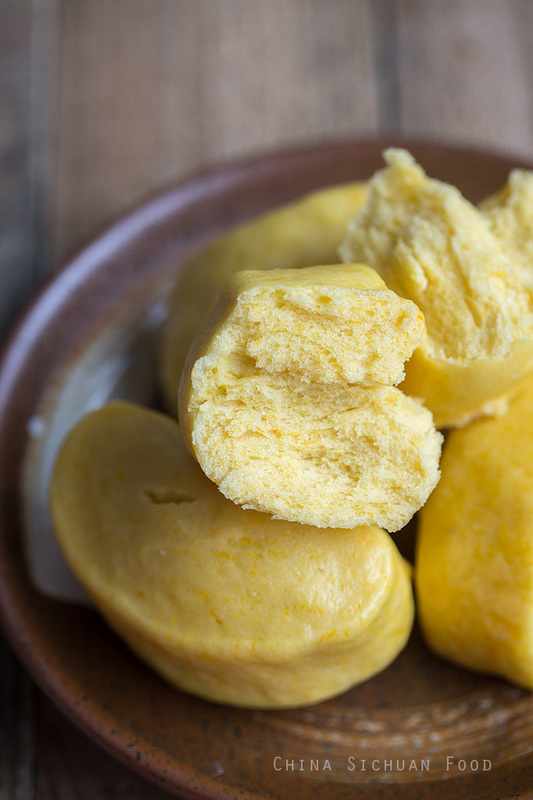 Clean the pumpkin; remove the skin and the filling, cut into small cubes. 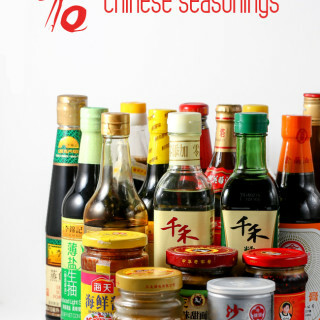 Place all the cubes in a steamer and steam for around 20 minutes until well softened. Then blend it until really smooth. Set aside to cool down to Luke warm. 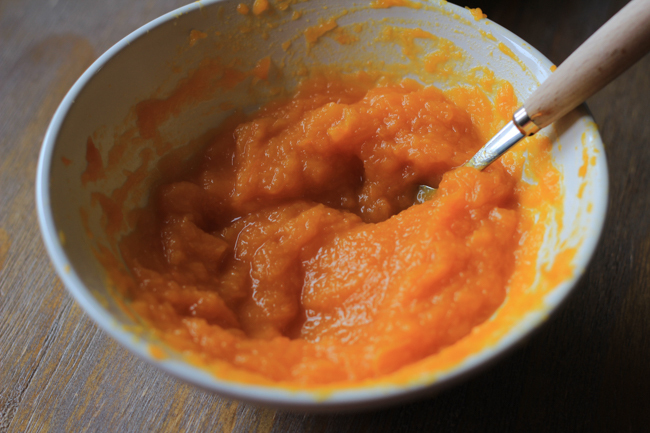 In a mixing bowl of a stand mixer, add all-purpose flour, salt, sugar and yeast then pour in pumpkin puree. Knead for 6-8 minutes until you get a smooth, elastic and soft dough. 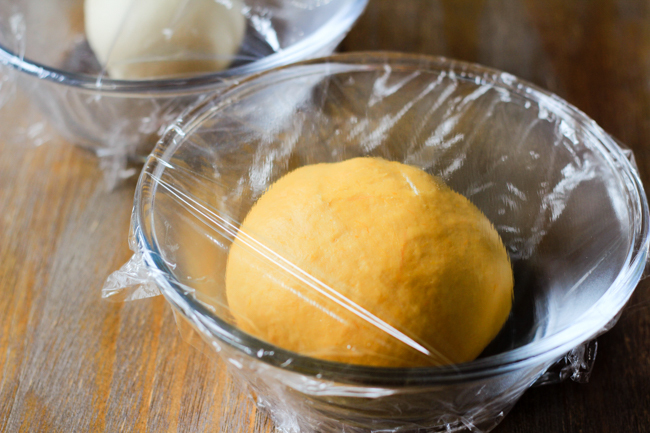 Transfer it to a bowl and cover with plastic wrapper until the dough is almost double in size. Dust your operating board with a thin layer of flour and re-knead the dough until the surface becomes smooth again. Divide the dough to two halves. Shape one of the two halves into a long log. 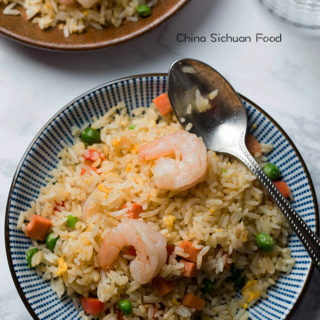 Cut it into 8 small portions. Then repeat to finish the other half. 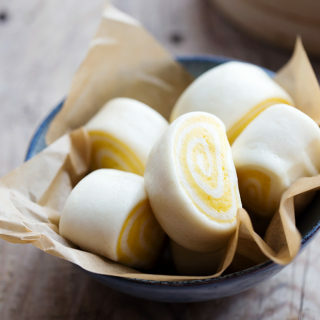 Make plain white dough according to Chinese steamed buns. We need half of the pumpkin dough. 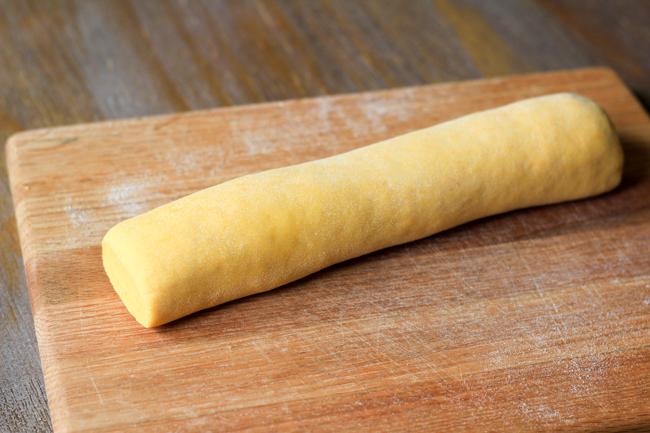 Re-knead the two dough balls until smooth again and roll each one out to a large rectangle (around 20cm long and 9cm wide). Lay the pumpkin wrapper over the white one and then roll the layered wrapper up tightly. Divide the long log into two shorter ones. Take one out and slightly press the log to make it longer and tighter when rolling on the operating board. 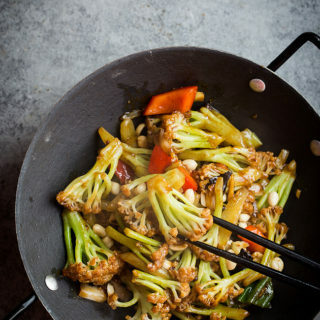 With a sharp knife, discard the two ends and cut the remaining part into 6 equal portions. Repeat to finish all. 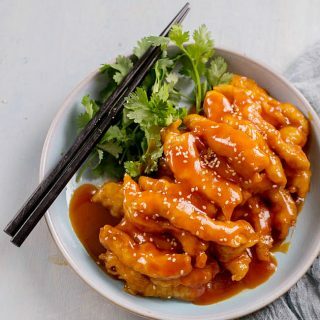 This sounds great, I loved buying pumpkin flavour mantous in China and would love to make some myself. I’m wondering which type of pumpkin would commonly be used for these? I cannot give the exact type name of the pumpkin I use in the recipe. 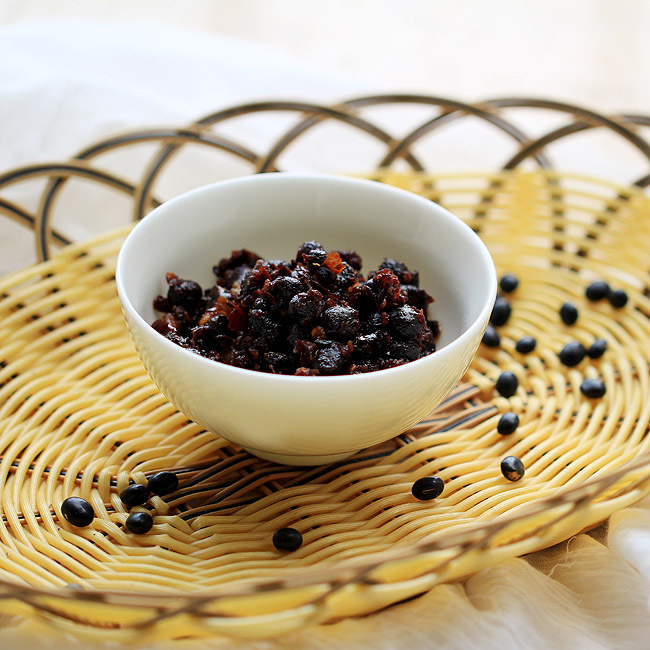 But it is quite big, with dark yellow color and quite sweet. Can I substitute the pumpkin with sweet potato? If so how much? Yes, you can use sweet potato as a substitute. But I do not know the exact amount currently since the water contained in the two ingredient are different. 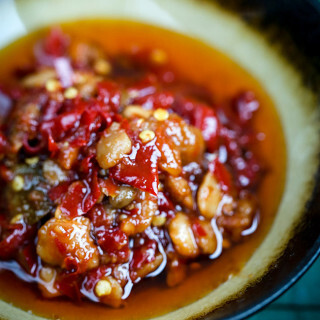 Thank your this great recipe, it works great for this season. (I know it is Mooncake time but I’m too scared of making them ^^ ) So I’ll try some pumping Mantous maybe even in shape of a pumpkin…. 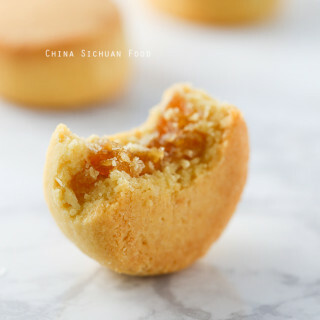 Happy Mid Autumn Festival to you! Thanks for such a lovely comment. And I a so sorry for the late reply. We had too many holidays in the past two weeks. Butternut squash should work fine for this recipe. Go ahead and use them.